Growth factors are chemicals within the body that help to regulate the cell growth, repair, and replacement that keeps the body functioning properly. They help to modulate cellular metabolism. They delay the onset of degenerative diseases. 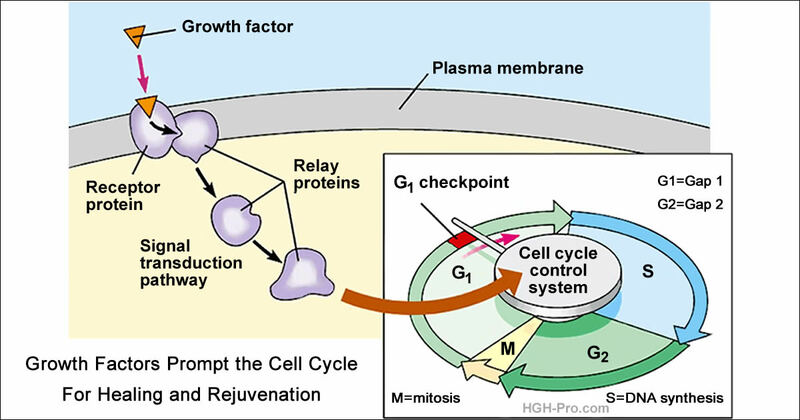 Growth factors are responsible for cellular repair and the replacement of worn out and damaged cells. They are also responsible for keeping the body's metabolism strong and balanced. These abilities decrease as we age due to the decreased supply of the body's growth factors. Example: When we are children our skin is soft, supple and moist, and it even has the look of health and youthfulness. When we sustain a cut or scrape the skin is swiftly healed with new healthy cells. Children have plenty of human growth hormone being produced and released into the bloodstream and so they have plenty of growth factors. In children the body works optimally because it has plenty of growth factors to use to continuously heal itself. Around age 20 the amount of HGH the pituitary gland releases starts to decrease and by the late 20's the effects may already be starting to become noticeable. The discouraging thing we know is that the older we get the less growth factors our body will have to heal and rejuvenate itself. Without intervention the body will begin to break down more often and the break downs will become more serious. In fact, without intervention our future of health is very bleak. Luckily, we live in this day of anti-aging medicine where we do not have to stand helplessly by and watch our body literally break down from its lack the hormones and growth factors. We know what an important role the lack of human growth hormone plays in the process of aging, and as more is being learned about aging research is suggesting that growth factors, specifically IGF-1 and IGF-2, may be a real key to successful anti-aging therapy. Once the pituitary gland releases human growth hormone it is quickly taken in by the liver. The liver then releases growth factors, and it is the growth factors that are directly responsible for most of the benefits associated with HGH. The major growth factor related to growth hormone is called IGF-1 (insulin-like growth factor-1). IGF-1 is also known as somatomedin C.
Another important growth factor is IGF-2 (insulin-like growth factor-2), also known as somatomedin A.
IGF-2 is a great maintenance growth factor and is very important to the health and maintenance of the body's nerve cells and nervous system. With diabetic neuropathy peripheral nerves can break down over time and can cause considerable pain. Scientists did studies where they gave diabetic rats IGF-2 and it prevented neuropathy. We now know there are many different growth factors in the human body and they all seem to decrease with age. A study entitled "Biometric Analysis of Controlled Clinical Study for Growth Factor Formulation on Multiple Parameters of Aging Related Dysfunctions" was done by Dr. M. Suarez and colleagues. The study was made up of 30 healthy men and women with a mean age of 53. 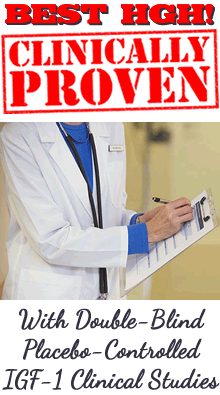 The test subjects participated in a 30 day or 60 day controlled clinical trial. "Clinical evidence demonstrates that the replacement of growth factors significantly reduces symptoms of aging." The results of these studies showed the beneficial effects human growth factors had on these hormones. Reference: Suarez, M., et al., "Biometric analysis of controlled clinical study for growth factor formulation on multiple parameters of aging-related dysfunctions," High Tech Research Institute, 2002. Scientific research has shown deer antler velvet to be a superior source of many growth important factors. Click below to see the list of growth factors and other health and anti-aging components that are contained in deer antler velvet, a major ingredient in our HGH Plus IGF-1 & IGF-2 product.